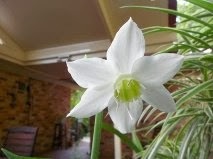 Coffs Harbour Garden Club: Eucharis Lily, Success! The exquisite 'Eucharis lily' also known as 'Amazon lily' (Eucharis grandiflora), is a member of the Amaryllis family and was originally collected along the Rio Magdalena. This low bulbous plant has broad, glossy green basal leaves and glistening white trumpet-shaped flowers (rather like a white daffodil) and delightfully fragrant. 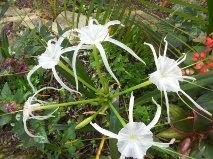 The flowers are borne in clusters of 3-6 blooms on a 60cm (2 foot) tall fleshy stalk. The Eucharis lily prefers bright indirect light or semi-shade. Water liberally from spring to autumn however water moderately in the winter. The Eucharis lily is a topical plant enjoying moist-warm conditions. It does not like cold nights, so a minimum of 5 degrees is required, even in the winter. Sponge leaves occasionally during dry weather to increase air humidity. Repot in spring every 3-4 years or as needed. To propagate, detach offsets or bulblets from mature plants in summer, keep warm and water sparingly until growth starts. We are so thrilled because our Eucharis Lilly has flowered after 6 years having it in different positions. The flowers last about a week and we are delighted. We grow it in our pergola which is mostly in shade but has sun for a small portion of the day. They are also known as an Amazon Lilly. 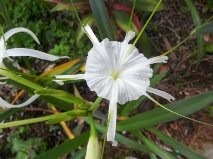 The Spider Lillies always delight us as we watch them come out in the evening. They grow in the garden surrounding our dining room. Thank you so much Marie & Graham for sharing your beauties. Firstly, Congratulations for a beautiful blog.It is great to have all the up coming events listed. Many Thanks Daphne. why do i have trouble with my Eucharis leaves turning yellow at different times? has a photo of a Eucharis Lily that is affected by oedema. If your lily leaves have a similar appearance, I would suggest that you follow the steps in the link and perhaps your problem could be solved! I wish the very best of luck with this problem. Well my Eucharis lilies have been in the same pot for over 10 years haven't been game to separate them they flower beautifully each year they are stuck behind our small rain tank and see very little sun and our winter temps get below 5dgrees often small frosts out here at Bonville. A member of the Coffs Garden Club has some excess bulbs - if anyone is interested I can pass on her details to you.